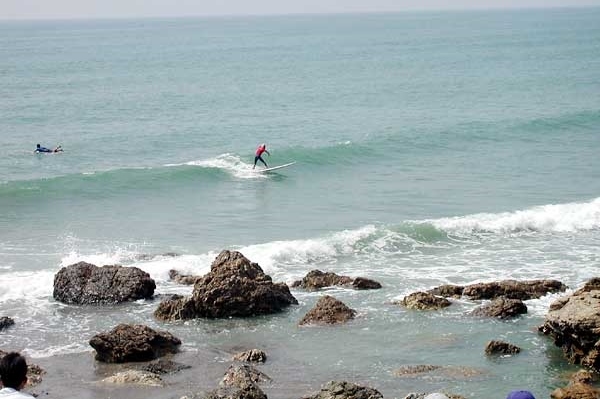 "Surfing in Japan? Are you serious?" is something I frequently hear when I mention summer activities. Its true that the quality of surf (even in prime conditions) will not usually be able to match waves in Bali, Australia, Hawaii or other well known spots. However if you do want to surf, and don't exactly have enough spare change to fly overseas for the weekend, then fortunately there are some good surf beaches around. 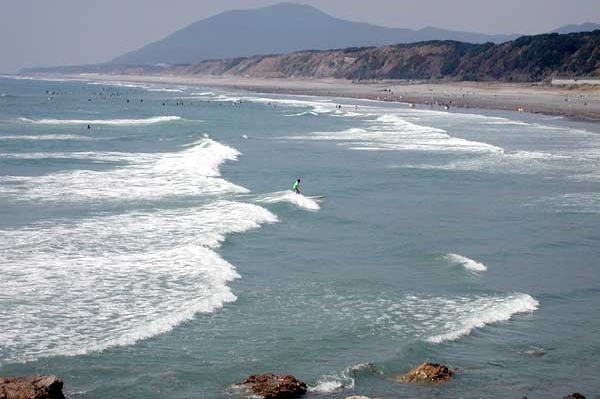 In Aichi Prefecture, the place to catch waves is on the southern shore of the Atsumi Peninsula. 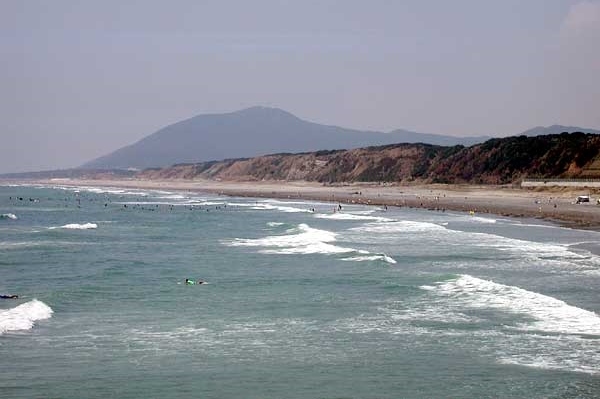 Every summer (actually from Spring right though to Autumn) the long stretch of Pacific Ocean beaches here attract surfers from all over Japan. 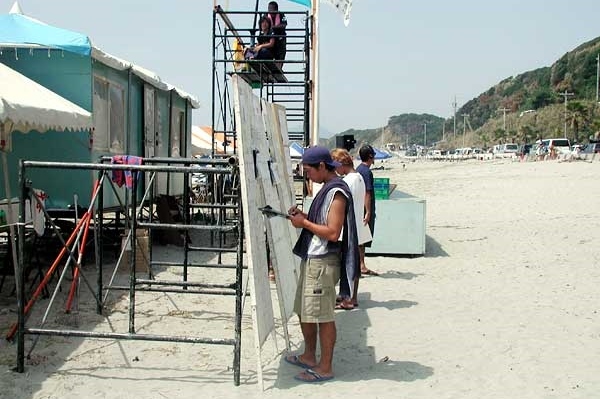 Surfing competitions are a regular feature, with Akabane beach enjoying perhaps the best reputation for decent waves. 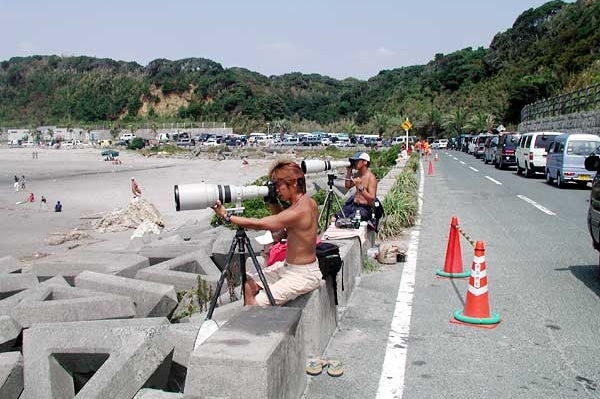 And you will be doing well to encounter a friendlier surfing community than Japan's. The long Atsumi peninsula separates the ocean from the protected waters of Mikawa Bay. It stretches from Toyohashi City, west to the great headland of Cape Irago and the ferries across the mouth of the bay to Toba. The peninsula has a very mild maritime climate - spring starts as early as February. Running the length of the middle of the peninsula is a rugged line of hills covered in forests. Between these hills and the long, sandy beaches is a thin strip of farmland, most of which is dedicated to horticulture. In the winter, the peninsula with its wetlands, tidal flats and unspoilt (so far at least) nature becomes a crossroads for migratory birds, attracting photographers and birders. Surfing in winter is of course possible if you have all of the gear, and a preference for solitude. However from late spring onwards, the peninsula becomes the home of a very different species - the summer surfer. Once the surfing season gets underway, this part of Aichi becomes mecca for just about every waxhead from Kansai to Kanto. 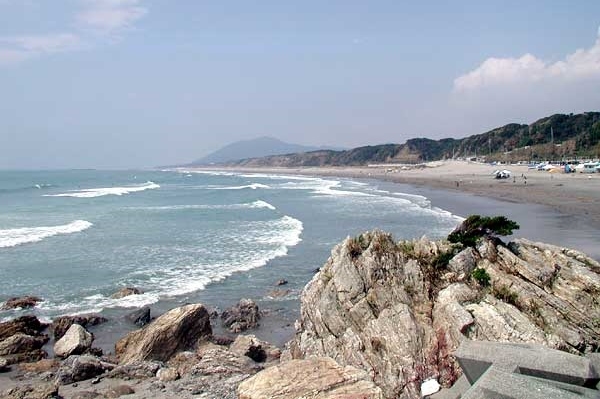 Compared to many beaches elsewhere in Japan, the area has many advantages. The waves are usually better than elsewhere, prices are lower (car parking lots are free), and the area is nowhere near as crowded as the beaches in Chiba and Wakayama prefectures (which are too close to Tokyo/Yokohama and Osaka respectively) so there are usually not too many surfers in the lineup waiting. A little further away from Akabane beach, most regulars know where some good breaks (sorry - not going to publish them here) often occur. On the downside, traffic can be a problem though. If you have a quick look at the license plates of the cars you'll soon note the large number of surfers from Osaka, Kyoto, Shizuoka and all of the inland areas. Many of these surfers will have driven for 5-7 hours through the night after checking the wave reports. More often than not, they'll come anyway. Another downside for foreign visitors is that there is no real public transport options available. Buses are infrequent - you need to rent, borrow or jump into a friend's car. Seeing "Driving in Japan" for more information. Respect the locals. As with any other surf beach in the world, the locals will object to your presence if you make a nuisance of yourself. Its worth observing a local as you will have the chance to understand the idiosyncrasies of a break, and any danger spots. 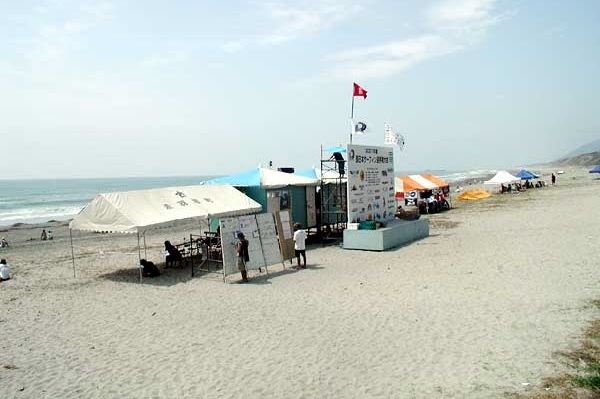 If you are going to be here for more than one summer, then be polite and friendly - if you can make a friend you will not only have more fun and get more Japanese practise, but you may also be invited to surf some well kept secrets. i) Keep out of other surfers way. If someone is riding a wave paddle toward where they have come from, not across their line. Sooner or later you may find yourself in someone's way - apologise politely. 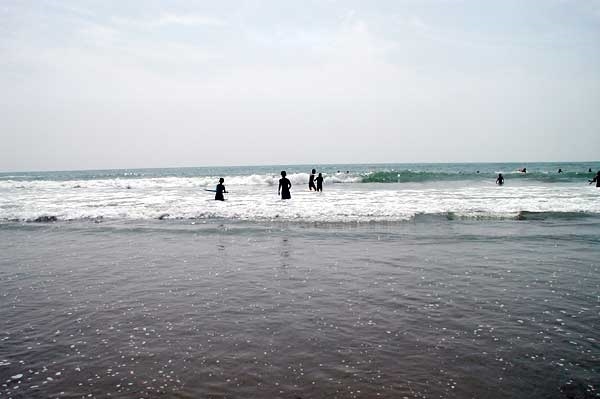 ii) Keep an eye out for swimmers - especially in August when there are frequently people who rarely go to the beach out in the water. iii) Do not bail from your board before checking to see if anyone is behind you. Secure your valuables. It unlikely that anything will be stolen, and compared to Bali and other surfing destinations it is extremely safe here. HOWEVER - lock valuables in the car or ensure that someone stays with your stuff when you are in the water, or (if all else fails etc) use the Australian method of hiding your keys and wallets inside your sandshoes. Learn the language - or at least make an effort to learn the surfing terminology in Japanese. Bring your own gear if possible. If not, bring enough money! The easiest way to get to the Atsumi Peninsula is by car. If that option isn't available to you, then from Okazaki station, take a train to Toyohashi on the JR Tokaido line, then transfer to the Toyohashi Tetsudou line. 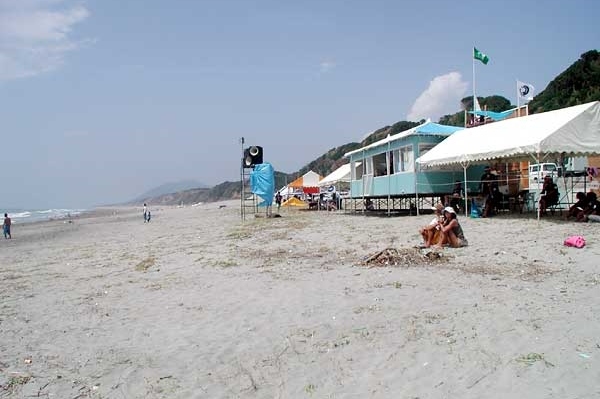 From the terminus you need to take a bus for Akabane beach. To see most of the Atsumi Peninsula though, you will need to use road transport.